One of the best Islands to visit in Australia | What to do at Rottnest Island! Recently we visited Western Australia. We based ourselves in Perth with our kids, and spent a few lovely nights at the beautiful Novotel Perth Langley. 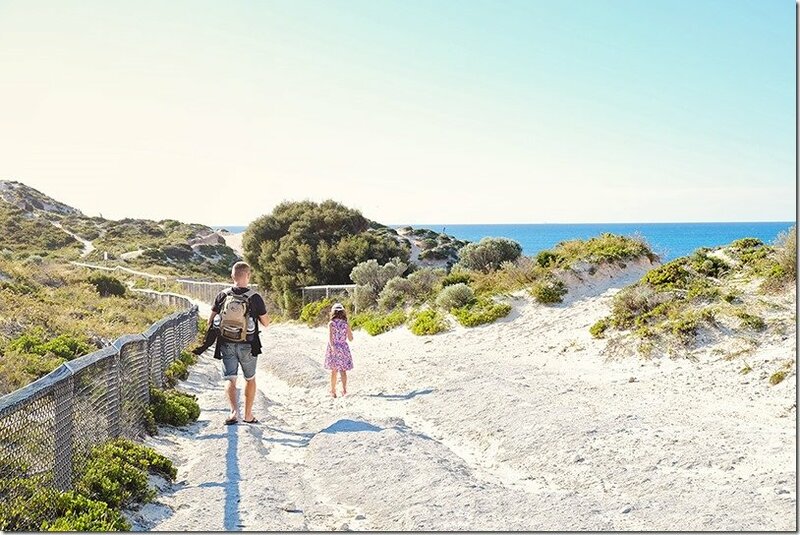 Whilst we enjoyed scouting out some kid friendly activities in Perth city itself, we also wanted to find out what some of the best day trips from Perth were! Whenever we get a chance, we love to leave behind the city sky rises in order to seek out more natural environments. I think that in a world which is now so technology driven, sometimes it is that connection with nature that calms our souls and rejuvenates the batteries! 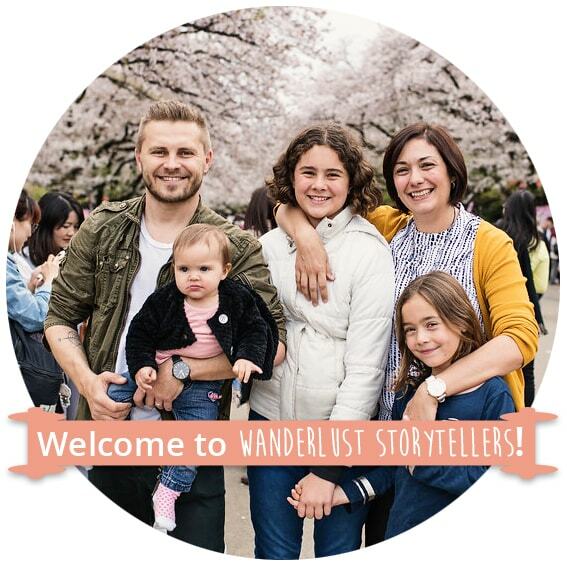 Add on the benefit of being able to reconnect with your family members and to truly just enjoy some quality time together, where conversations flow so much more freely and where playing together, laughing together and walking hand in hand is the norm! For us, the value and benefit of time together in nature are invaluable! 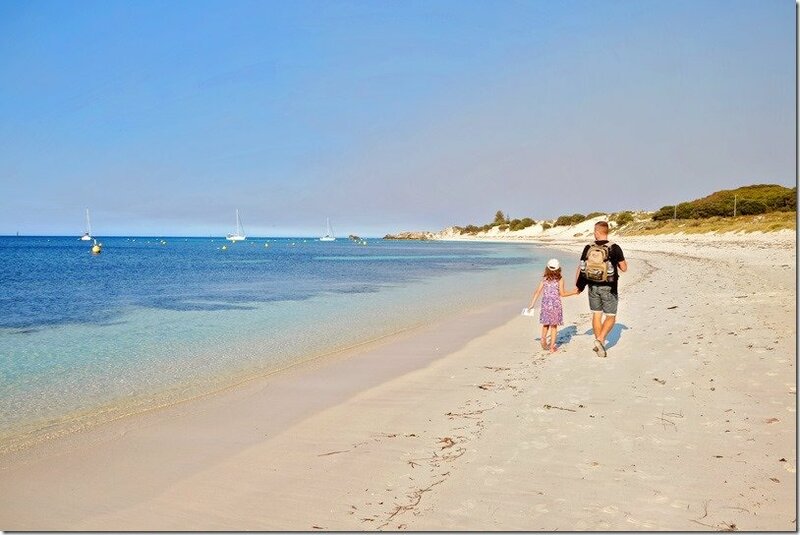 Believe it or not, but up until our stay in Perth, we had never heard of Rottnest Island. To think that we didn’t even know that this stunning island even existed?? We were definitely missing out! 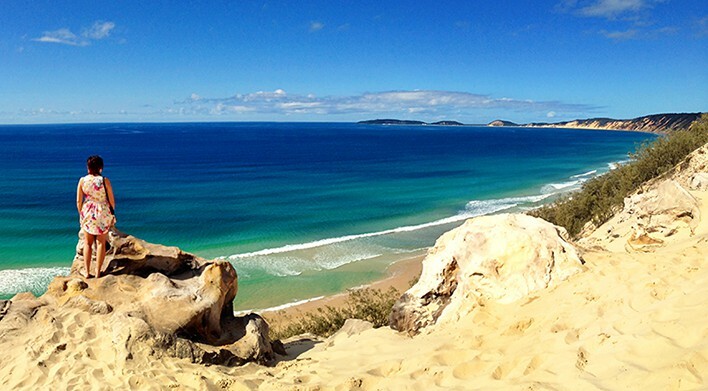 After visiting this gorgeous natural piece of paradise, we have decided that it deserves a spot on the list as one of the best islands to visit in Australia!! 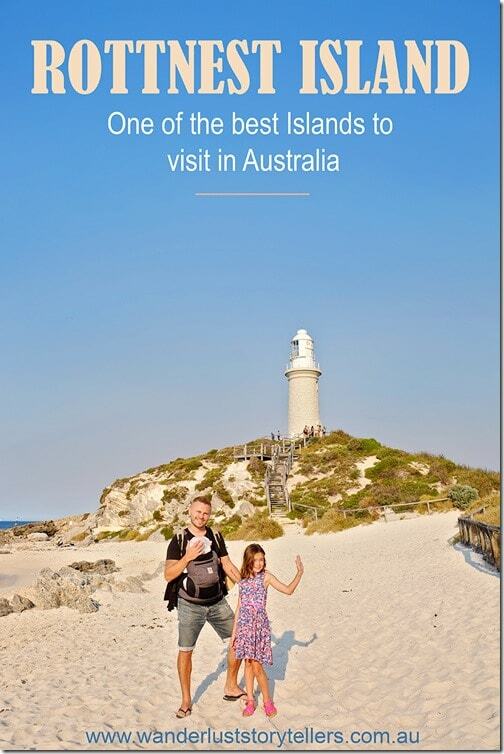 Find a super handy detailed guide of what to do at Rottnest Island! We have visited quite a few islands in Australia! 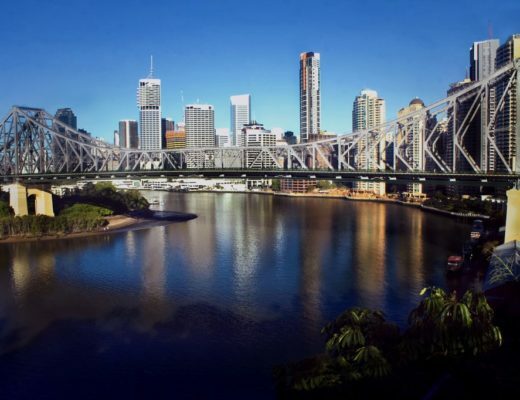 We have our favourite ones for adventure, such as Fraser Island, and we have other ones on the list to relax at such as Hamilton Island. Rottnest took us completely by surprise! We didn’t expect to find such a sensational island so close to the mainland. 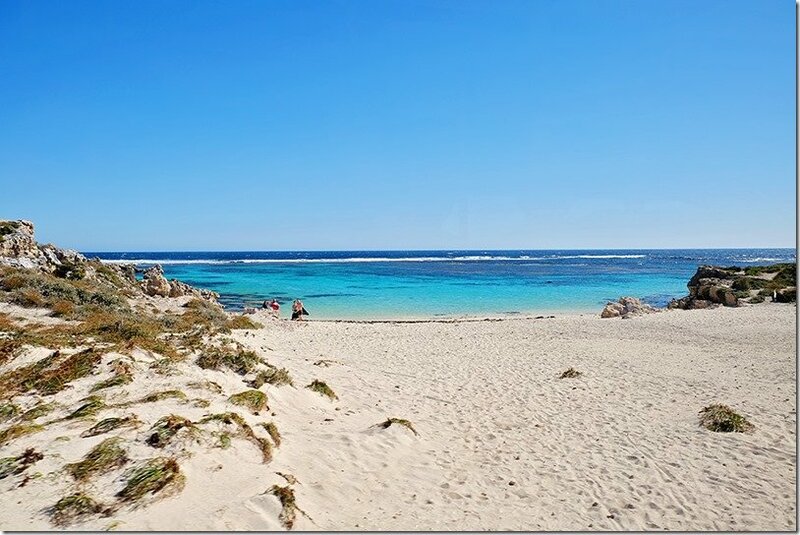 Rottnest Island boasts some of the finest beaches that I have ever seen! The shades of blues that are found at every beach and bay around this island keeps on to amaze me! This beautiful place forces you to slow down to fit in to its laid back, casual atmosphere! It forces you to unwind and it takes pleasure in forcing you to fill your lungs with fresh air! No driving is allowed on Rottnest Island; it is one of the things that makes this island so special. So exploration by foot, bicycle or bus is the norm here! And whilst we classify this island under one of the best day trips from Perth list, we actually fully believe that this island deserves more of your time! So if you can why not book in for a few nights instead! 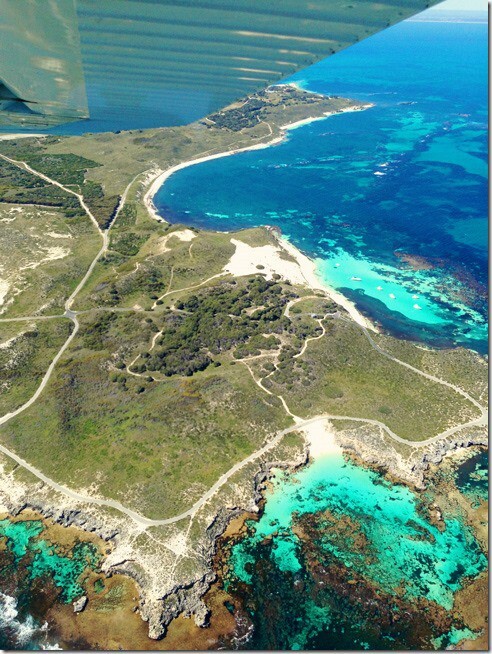 Where is Rottnest Island located? 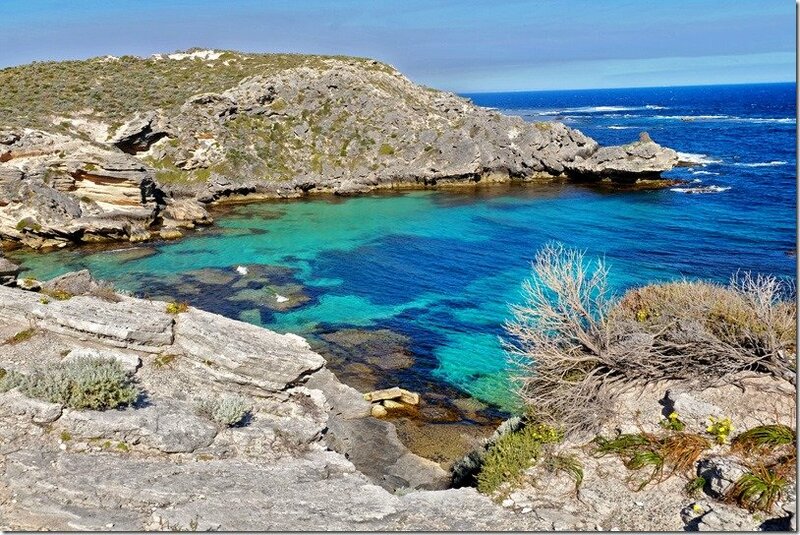 Rottnest Island is located off the coast of Western Australia, located around 18 kilometres from Fremantle. 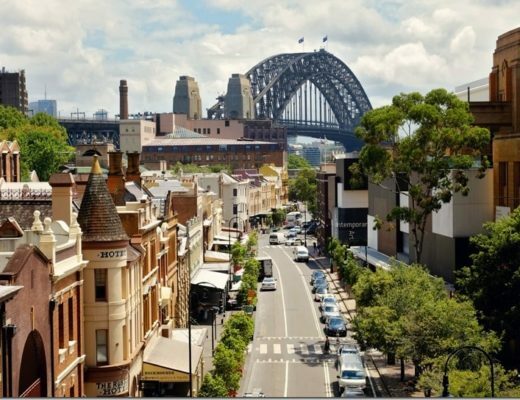 If you are visiting Freemantle from Perth, you can easily reach this town via an easy train ride, or alternatively, if you have a rental car, the drive should take you around 30 min. 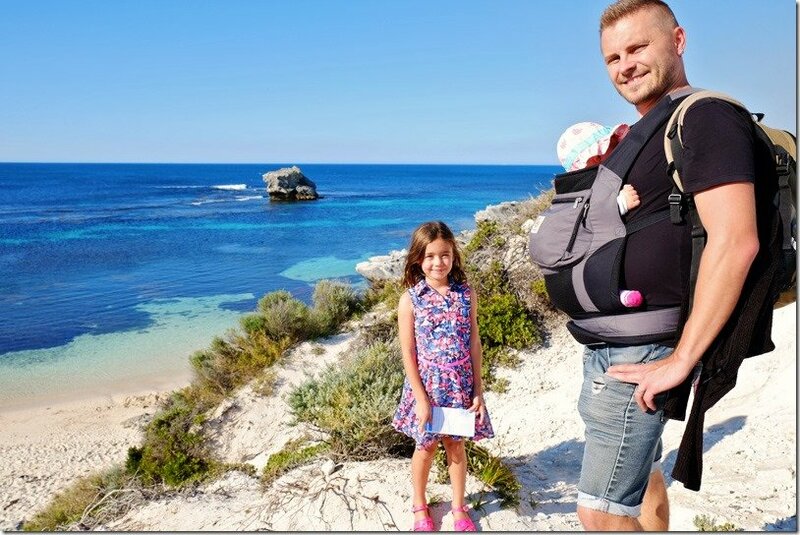 How to get to Rottnest Island from Fremantle? The easiest way to get to the island is by taking the ferry from Fremantle to Rottnest Island. The ferry ride from Shed B is only 25 min in duration! In order to use your AMEX card, you will need to book online. 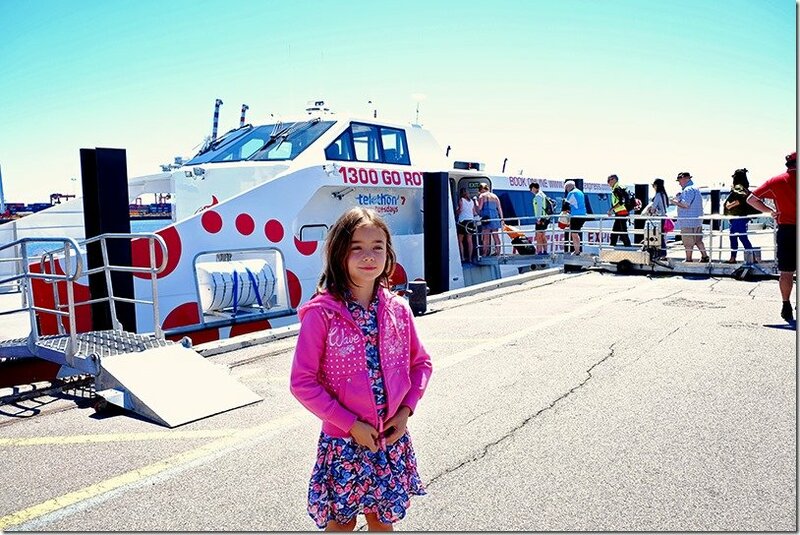 Visit the Rottnest Express Ferry site here to find out about the ferry times to Rottnest, as well as to book your ferry and pre-pay for a variety of activities on the island. Another first for us was meeting the cute little Quokkas on Rottnest Island! This island is the primary home of these little marsupials and they were truly just adorable to watch. They are very curious and with all the visitors to the island, they are not scared to come and pose for a little selfie either! 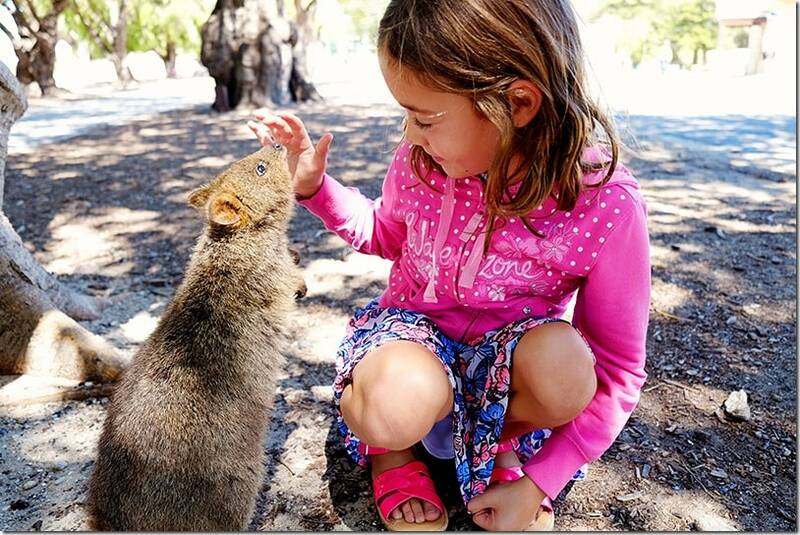 As you can see Lily totally enjoyed the Rottnest Island Quokkas. Pretty darn cute hey!? 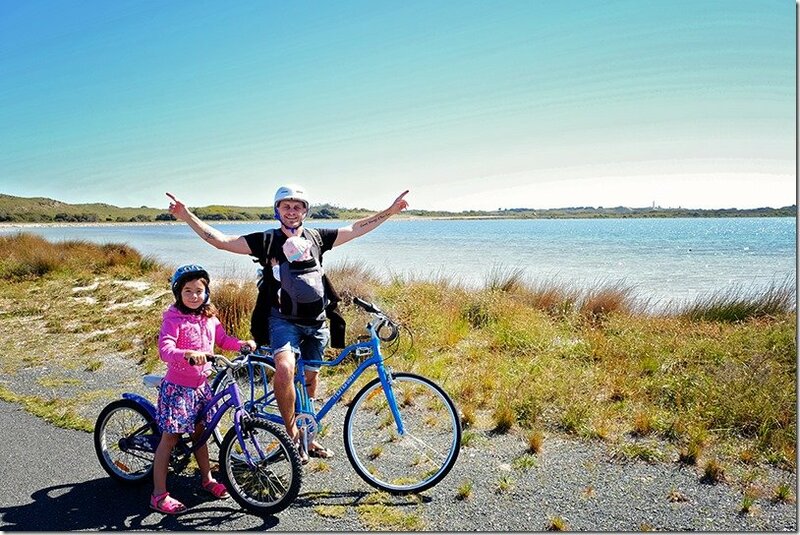 I think exploring the island by bicycle must be the most popular thing to do at Rottnest! Everywhere you go you will see people bicycling …. you will even find bicycle racks at the main popular beach spots!! Lily persuaded us to hire some bicycles, even though we had a little 3-month-old baby! 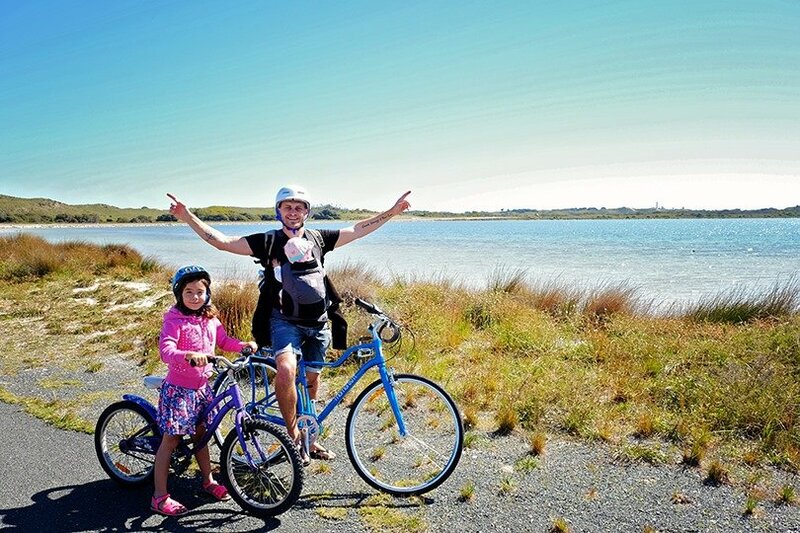 Lucky we had a baby pouch for her so we just decided to go slow and go for a smaller ride rather than trying to cycle around the entire island! There is something to be said for having wind blow through your hair as you pass by some incredible scenery!! It was very enjoyable and totally relaxing! Here we are cycling past Government House Lake …. I wonder where we are going?? I wonder why Lily is so eager to get to the destination?? Well, I guess you will just have to keep reading to find out!! 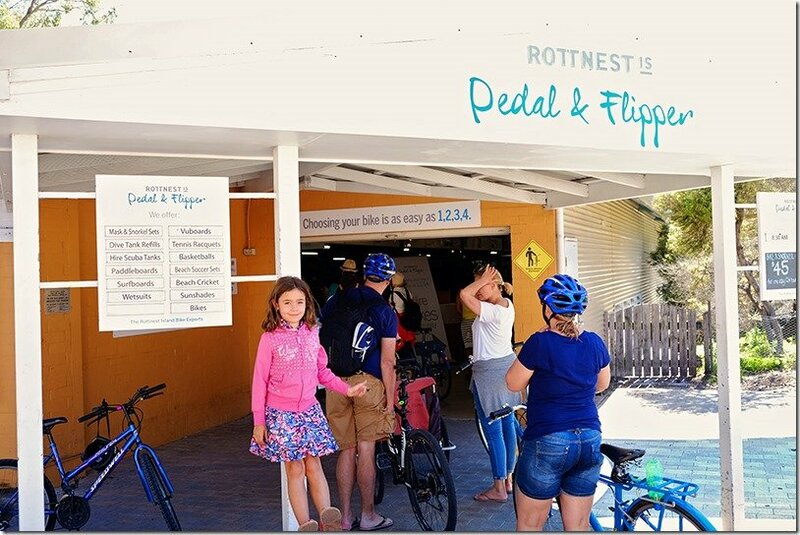 You can easily hire your bicycles from the Pedal & Flipper which is located in the main town area (just behind Hotel Rottnest), which is where your ferry will drop you off! They have a very efficient system and have a large variety of bicycles on offer (including kids bikes, bikes with training wheels, bikes with trailers and bikes with kid seats)! They even have electric bicycles for those that prefer a bit of an easier option of exploring! They also hire out a range of other equipment such as snorkelling gear as well. A handy one-stop hire shop! Rottnest Island Bike Hire Prices: Adult bikes are $30 per day, you can find a detailed price list of their equipment for hire by clicking here! 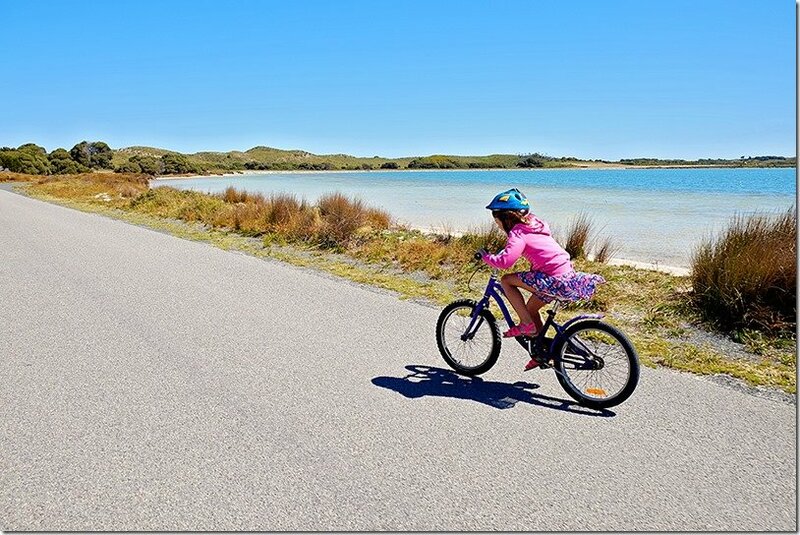 Rottnest Island Bike Hire Online: You can pre-purchase your bike hire online here if you prefer. 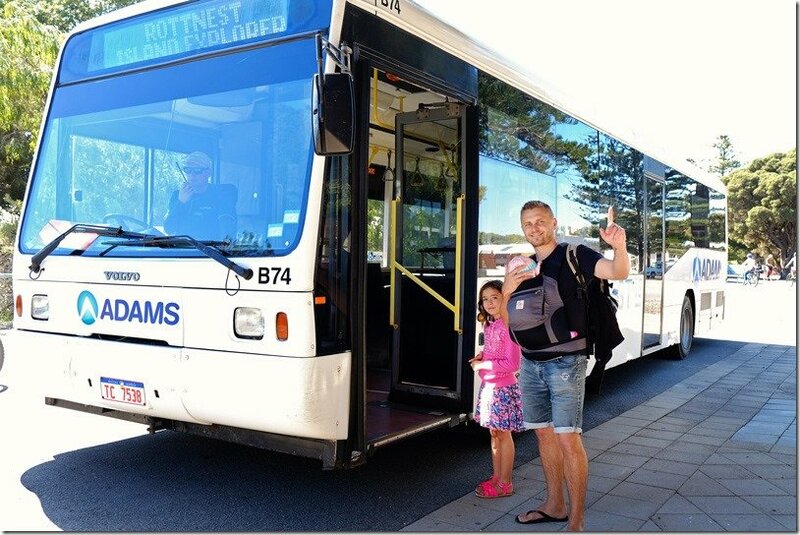 For those of you who do not like the idea of exersize as much, or for those of you who are travelling with a little bubby like us, the ‘hop-on-hop-off’ Rottnest Island bus will be your friend. The bus loops around the island, which means that if you get off at a stop, you will have around 45min to spend there. For those of you who are on a day trip, this means that you will need to pick your ‘stops’ carefully as you will not be able to stop at each of the 19 stopping points!! The bus ride itself is truly beautiful as you pass by shipwrecks, stunning beaches, pristine bays, lighthouses, lakes and so much more! Island Explorer Bus Schedule: Do make sure you have a look at the bus schedule. The Visitor Centre will give you a map for the island which contains the bus timetable as well! We didn’t realize that the latest bus runs pretty early, so we thought we would be able to see more than what we could in the end and where slightly disappointed. The first bus runs from 8:45am (from the main bus stop) and the last run is at 3:00pm (from the main bus stop) (occasionally they have a 4:15pm run too). Of course, everyone heads over to any island because of its beaches. 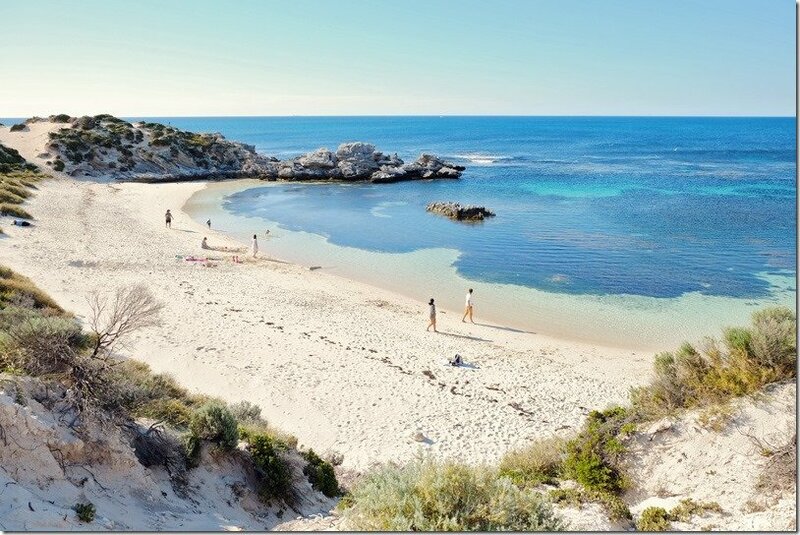 Rottnest Island goes one extra notch in boasting some of the most beautiful beaches in the world! The powder white sand against the contrasting shades of blue water is truly a sight you will never forget!! Whilst some beaches are brilliant for snorkelling, others feature a shipwreck, one bay is specifically fabulous for whale watching whilst others are known for being perfect for families and swimming! There are so many beaches to choose from that it can feel a bit daunting! As a brief outline, if you are after swimming, we suggest you check out ‘The Basin’, ‘Parker’s Point’ and ‘Salmon Bay’. If you are after snorkelling, we heard that ‘Little Salmon Bay’ is the best! 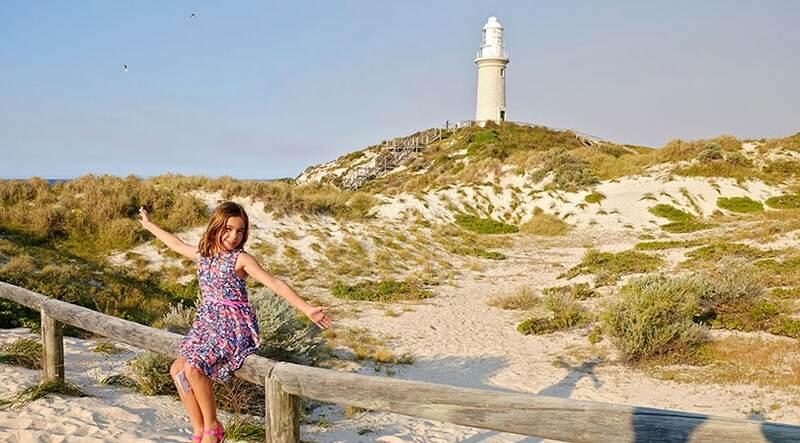 If you want to check out some incredible views, don’t miss the ‘Wadjemup Lighthouse’ and ‘West End/Cape Vlamingh’ stops and if you are hoping to spot some whales, spend some time at the West End of the island! Little Salmon Bay, well known for swimming and snorkelling! Fish Hook Bay at Cape Vlamingh. The area has a platform where you can see some glorious views. You might also spot a whale or two playing there! Geordie Bay. We decided to get off the bus at Geordie Bay (Bus Stop 19) and walk all the way back to town (around a 20-30min walk). It was late in the afternoon and it was truly a glorious walk!! Just look at the water!! Fays Bay is a tiny gorgeous little bay in between Geordie Bay and Longreach Bay. I think this one was one of my favourites, we also saw a few families enjoying some time on the sand here! Some noisy birds around, but the atmosphere totally serene! Longreach Bay Rottnest Island is the Bay for all the luxurious boats to anchor. Those white boats against the blue water is truly gorgeous! This stretch of beach is below some of the island’s holiday accommodation houses, so many families were out here on the beach playing with their kids! 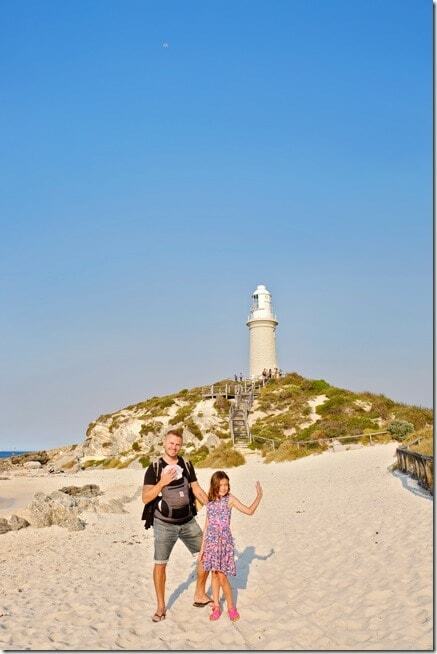 There are actually two Rottnest Island Lighthouses which you can visit! The Wadjemup Lighthouse is a great one to visit if you would like to get some beautiful views over the island itself. As we were short on time, we only visited the Bathurst Lighthouse which is located within walking distance from the main town. We visited the lighthouse late in the afternoon and the sky was slightly changing colour from blue to pink. The walk along here back to town is truly a gorgeous one, so do make sure to hop off the bus and get a short (10 min or so) walk in. So you have all been wondering what exactly we splurged out on on the island and here it is!!! 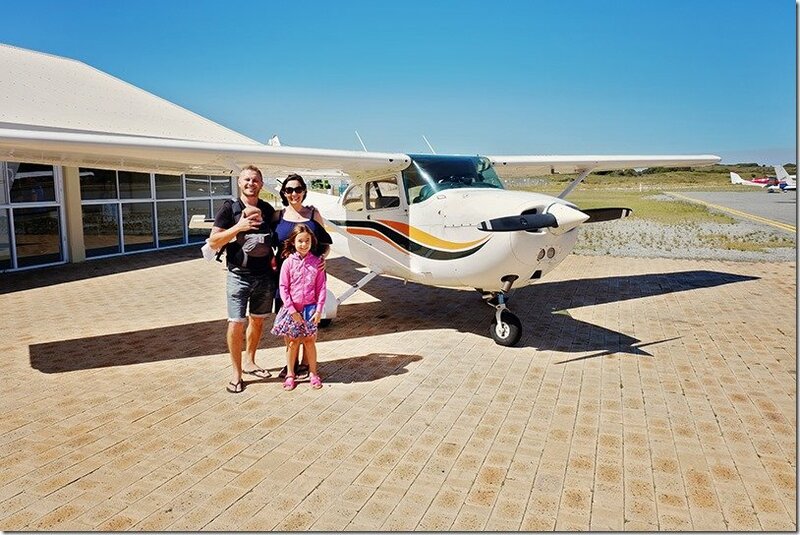 We found this gorgeous little scenic plane at the small airport located on the island. After a short discussion of asking questions in regards to flying with our 3 month old, we decided to be spontaneous and hop on the plane!! It was truly one of the most spectacular things that we have done here in Australia and the views from up high over the island were mind blowing!! Not only that but we also saw some whales playing in the ocean as well!! This option will cost $132 per adult and $66 per child. So for a family of three, this would normally cost you $330 out of your pocket. (Again make sure you use our links above so you can pay with your AMEX card as you won’t be able to do so directly on the island). So truly, what the heck are you waiting for!? 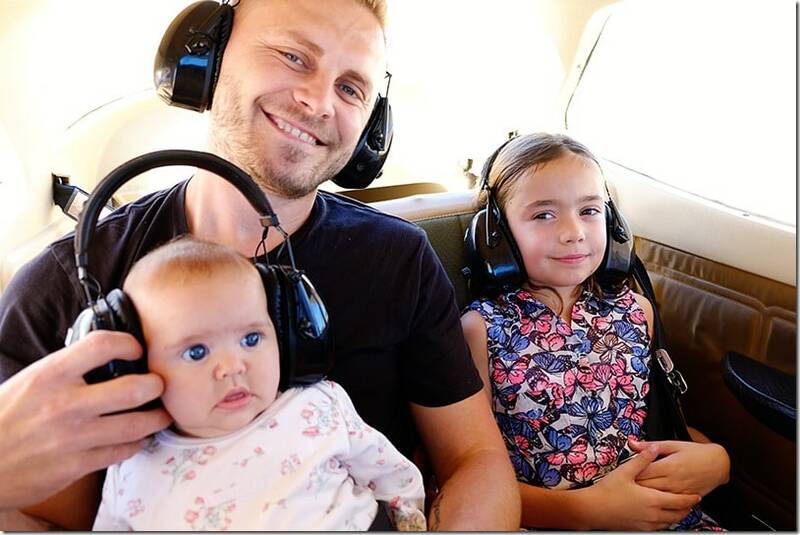 I bet your family would love some ‘time-out’ to spend some incredible valuable family time together! And why not spoil yourself with an activity and step away from the norm!! 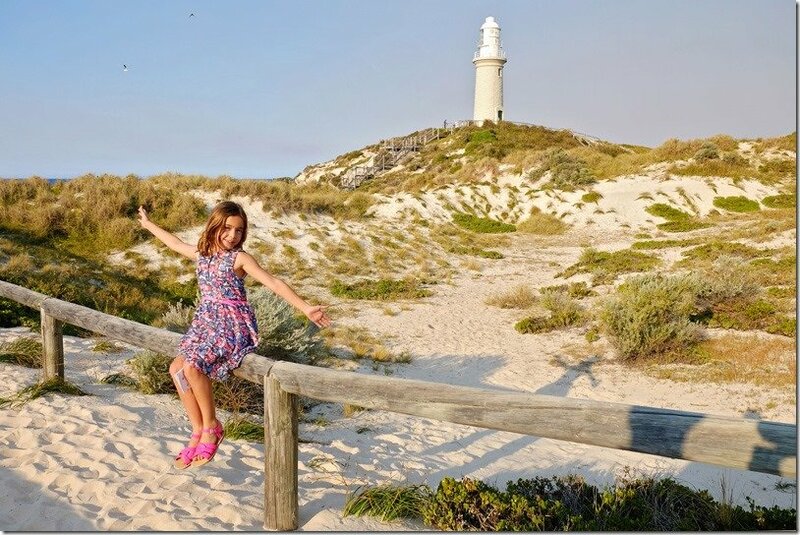 · Did you enjoy our beautiful Rottnest Island pictures? 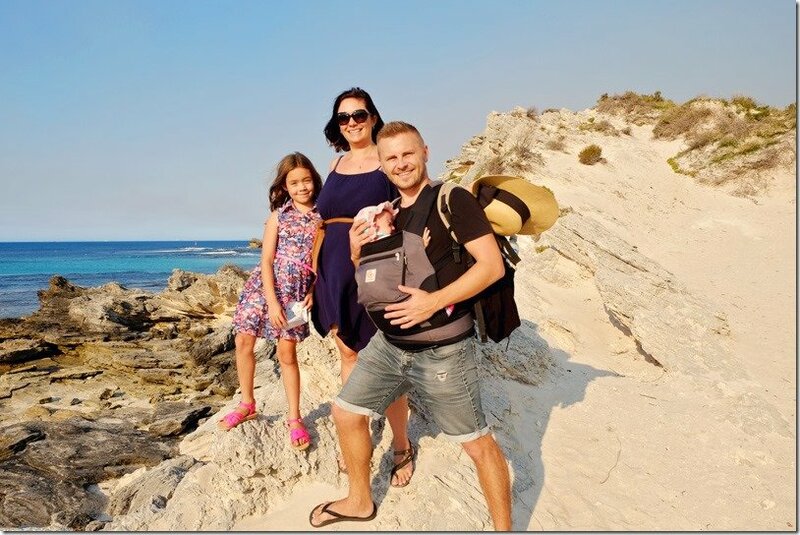 * We experienced our trip to Rottnest Island courtesy of American Express. All thoughts, opinions and experiences are our own. A very nice and well-written guide and lovely pictures too! Lily sure had a blast during your visit. She was in 7th heaven! It is such a great place for kids with the bicycles, a hop-on-hop-off bus, swimming, snorkeling and of course the cute quokkas! Thanks Alek! We actually never knew about it before researching what to do in Perth either and it is such a spectacular island that truly is worth a visit! I recommend you go in the summer (warmer months in Australia: November to March) so you can enjoy swimming and snorkeling!